The fixtures for the 2019 Premiership season have been released, with the Witches starting their competitive campaign with a local derby at home to King’s Lynn in the Supporters Cup. Before that cup match at the end of March, the Suffolk side have challenge meetings home and away against Championship side Leicester as they warm up for competitive action. Ipswich will face King’s Lynn, Poole and Swindon in their Supporters Cup group as teams race each other home and away with the winner of the group progressing to the final. After their early cup action home and away against the Stars, the Witches begin their Premiership campaign against Australian champion Max Fricke and his Belle Vue side at Foxhall in April followed by more Supporters Cup action home and away against Swindon, as 2017 world champion Jason Doyle brings his Robins to town. May kicks off with the visit of King’s Lynn in a bank holiday clash as the rivals lock horns in the Premiership and the champions Poole are in town later that month for a cup tie with the return of Nico Covatti to Foxhall. May ends with another familiar face in the pits as a Wolves side that includes Rory Schlein travels to Suffolk. 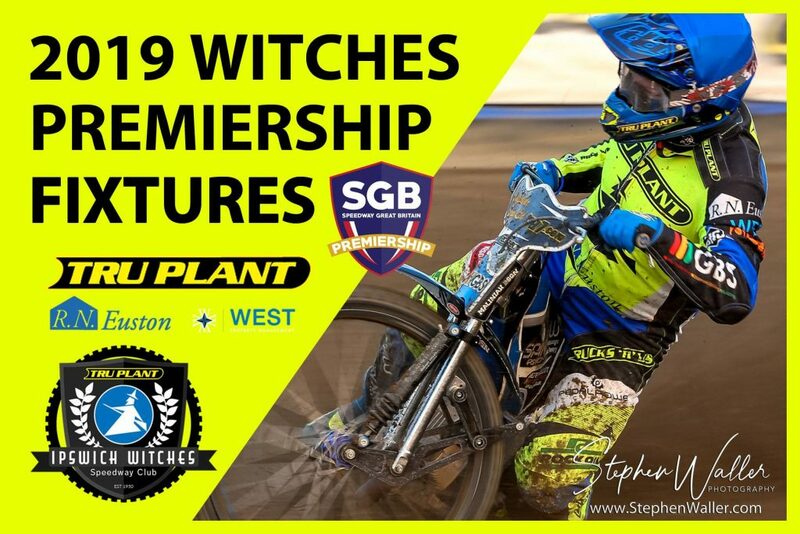 The Premiership season picks up the pace in June with the fixtures coming thick and fast as the Witches travel to the National Speedway Stadium to take on the Aces and there are local derbies galore against Peterborough and King’s Lynn. Ritchie Hawkins’ side face Wolves and Poole home and away in July before the season reaches crunch time in August. The Witches host the Aces, Robins, Panthers and Pirates in that month and they will be hoping to secure their place in the end of season play-offs. All fixtures are subject to change and fixtures that are live on BT Sport will be announced in the near future. Our full fixture list for the 2019 season can be found here.